New York Rangers President and General Manager Glen Sather announced today that the club has agreed to terms with forward Brodie Dupont on a new contract. One of the more experienced Rangers prospects with 225 regular-season games at Hartford under his belt, Brodie Dupont has said he feels ready to earn a spot on the Blueshirts' NHL roster for this season. In his third professional season, Dupont tallied his 100th career AHL point with a shorthanded goal on April 3 at Springfield. He registered a career-high, six-game point streak from February 12 at Providence to February 20 vs. Worcester, tallying six points (two goals and four assists) over the span. Dupont registered three consecutive multi-point performances from March 10 at Worcester to March 13 vs. Lowell, recording one goal and one assist in each contest during the stretch. In addition, Dupont posted two, two-goal efforts on November 6 at Providence and February 3 at Lowell, notching the game-winner in each contest. In 2008-09, Dupont established AHL career-highs in goals (18), assists (24), points (42), power play goals (four) and game-winning goals (five) in his second professional season with Hartford. He ranked fourth on Hartford in goals, tied for fourth in points and finished sixth on the team in assists. Dupont also registered his first professional playoff point with an assist on April 20 at Worcester, and registered two assists and 15 penalty minutes in six post-season contests. The 6-2, 210-pounder has skated in 225 career AHL games with Hartford, registering 44 goals and 59 assists for 103 points, along with 311 penalty minutes and a plus-nine rating. 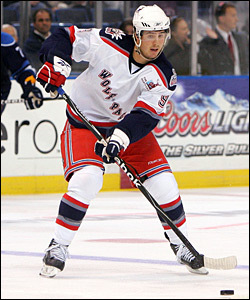 Dupont made his professional debut with Hartford on October 6, 2007 vs. Bridgeport, and notched his first point with a shorthanded goal on October 24, 2007 vs. Providence He tied for second on the Wolf Pack with two shorthanded goals that season. He also ranked third among team rookies in goals (nine) and points (22), and tied for second among first-year players in assists (13). The Russell, Manitoba, native was originally selected as the Rangers’ third round choice, 66th overall, in the 2005 NHL Entry Draft.